Not all who visit the Alps are there to ski. The mountains are alluring in their own right, spending time there is a perfect getaway for many. If you’re a non skier it makes perfect sense that your accommodation provides you with things to do. Spending time in and around a beautiful pool area is as good a way as any to spend time relaxing. If there’s one thing guaranteed to light up the kids faces on holiday, it’s when they discover that the accommodation they are staying in has a swimming pool. And it’s not just the kids who’ll appreciate this feature. Here are my top five luxury chalets, each with their own private pool. If you want to fly to the snow, you may also be interested in how to score a flight upgrade in 2018 and the latest flight sales & freebies. This chalet is the last word in opulence and exotic luxury. Carved wood, chandeliers, exotic fabrics and furnishings lift this fabulous chalet out of the ordinary and elevate it into a league of its own. 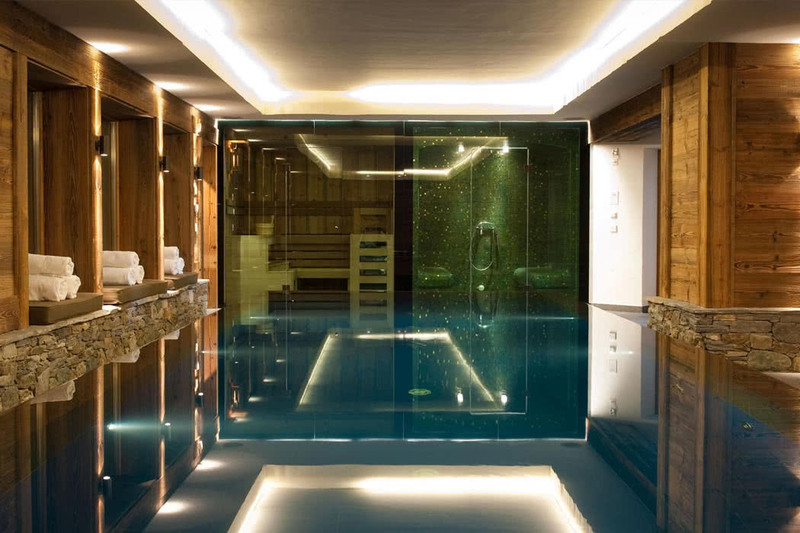 Wellness is at the heart of Chalet Marco Polo, the whole of the first floor is dedicated to relaxation and well being. The spacious pool with jet stream sits adjacent the hot tub and is flooded with natural light from the floor to ceiling windows. The sauna and relaxation area, complete with entertainment system, allows you to completely unwind and enjoy the ultimate luxury ski chalet experience. 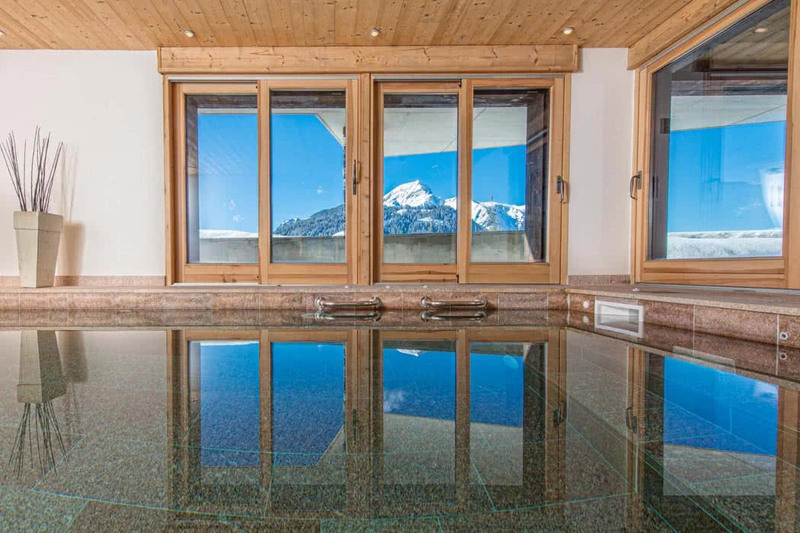 Situated in the heart of Val d’Isere, yet set back from the main road, the chalet affords privacy, sumptuous luxury and easy access to the centre of this beautiful high altitude ski resort. Marco Polo wasn’t averse to a little luxury and the finer things in life, after all he did much to introduce Europeans to the exotic delights of Central Asian and Chinese treasures. He left a lasting legacy and inspired others to follow in his footsteps. One wonders, were he still around today, what he would make of his namesake, Chalet Marco Polo, I’m guessing that he would be very impressed indeed. He’d probably don his budgie smugglers too, and have a quick dip. Chalet Dent Blanche is an absolute joy to behold. Full of wonderful artefacts, modern art, beautiful furniture and very tastefully decorated with a fine eye for detail and design. This gorgeous property was completed in 2009 and must surely be one of Verbierʼs most impressive private homes. 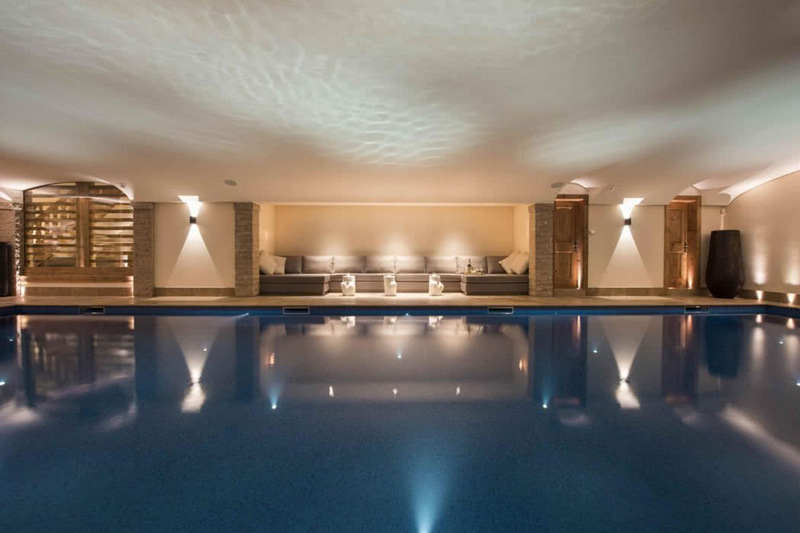 The ground floor of Dent Blanche is occupied by the amazing spa and entertainment area. Thereʼs a beautiful infinity pool for you to wallow in, Bring you own water cannons if you must, why not? A sauna and hammam are on hand to indulge yourself and soothe your limbs as you prepare yourself for another exhilarating day on the slopes. Adjacent to the wonderfully appointed spa and pool area is a plush cinema room, perfect for a night in at the movies. If you feel you have energy to spare, you could partake in a serious workout in the well-appointed gym. The chalet is conveniently located in the heart of the village but is discreetly hidden away in a quiet location. It proudly stands on the edge of the Verbier plateau and from this vantage point it benefits from spectacular and breathtaking views of the surrounding mountains. Chalet Dent Blanche is fitted throughout with state of the art entertainment technology, including iPod docking stations, DVD players, Wi-Fi and satellite TV. In short thereʼs everything you could possibly need for an unforgettable stay in this wonderful property. The architects took into account the mountain setting to allow for contact with the outdoors at every opportunity. The light floods into the interiors in the daytime and this makes for a wonderful ambience and offers you a constant reminder of your location in the spectacular mountain landscape. You definitely get a dose of the feel-good-factor here. The double height lounge with the open log fire is a wonderful place to relax and kick back. The spacious dining area looks out over the mountains and to top that off, you even have a bar area for pre-dinner drinks, you can even have your own lock-in, then down to the pool, and go wild. The phrase ‘the wow factor’ was coined for properties like this. Space usually comes at a premium, that doesn’t seem to have been much of a consideration at Chouqui. The architects have certainly been generous with the dimensions and you will feel the benefit. 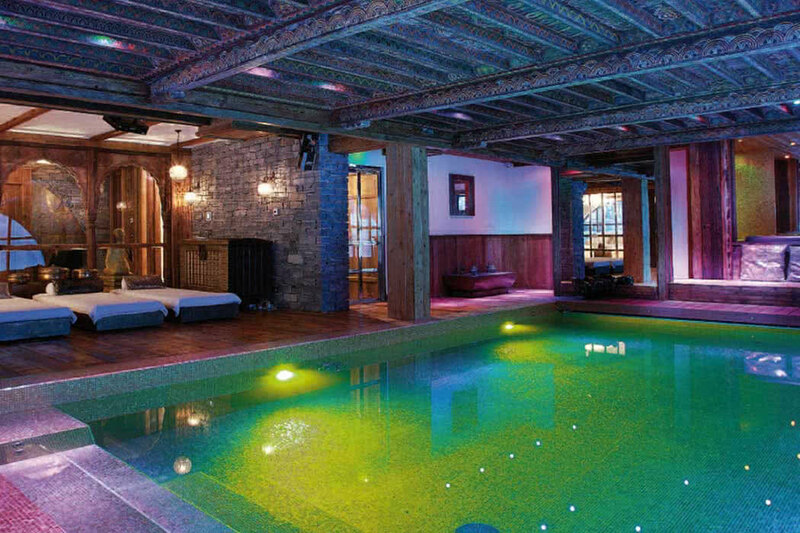 The chalet can accommodate 20 plus guests, considerably more people than that will fit in the superb 15m indoor pool. Why not have a splash party? Chouqui is a vast chalet on all fronts, the generously sized windows flood the mountain light into the interiors in the daytime. At night, with the curtains drawn, the candles and the log fire flickering along with the dimmed lighting, the living spaces become a different entity, cosseting and welcoming and thoroughly enjoyable spaces to inhabit. This is luxury and it’s your home for the duration. The facilities you will enjoy are second to none. The superb 15m indoor swimming pool will be a hit with all ages as will the dedicated cinema lunge, with its reclining leather chairs. The games room will provide hours of fun with Ping Pong and table football competitions. Non-skiers will have plenty to do here and we think even keen skiers will find it hard to drag themselves away from the confines of this delightful property. The kids will be out of your hair here, but be careful not to lose them. Chouqui is the chalet that keeps on surprising. The outdoor hot tub is superbly located to take advantage of the stunning mountain scenery. This is no ordinary plastic hot tub, this is a tiled affair and large too. At night, with the stars for a canopy, the soothing waters and the odd glass of champers, your fatigue from the exertion of a fabulous day on the slopes will melt away. As you arrive at the chalet, high upon the mountainside and striking in its dark, burnt wood, blending into the Alpine forest behind, it is clear this was a great choice for more reasons than one. It’s hard to believe the chalet wasn’t always there, this is a charmingly traditional building, sensitive to its surroundings and yet benefiting from up-to-date interiors, a modern layout with all the luxury touches you could wish for. Bursting with personality. By the end of the week when you’ve settled into that blissful holiday routine, eat, ski, eat, ski, swim, eat, sleep, repeat! you won’t believe it’s time to head back to the airport, but don’t worry as it’s only 90 minutes away, you definitely have time for one last dip in the pool. A unique experience is what you will remember. Memories of the hours spent in the private pool with the kids – the sound of them shrieking with laughter as they play mischievously with their friends, and delight in time spent having fun with you, as a family. You might forget you came here to ski! Ski you will though, and with no time lost. Just a two minute chauffeured journey from the nearest chairlift – with your driver there to help organise all the children’s’ ski kit – and the prospect of skiing right back to the door should you wish!